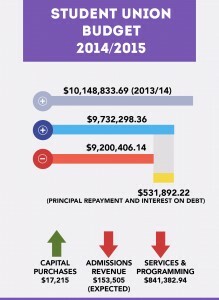 The Wilfrid Laurier University Students’ Union budget was passed unanimously in May by the board of directors, reflecting a projected deficit of $897,000 for the 2014-15 year. 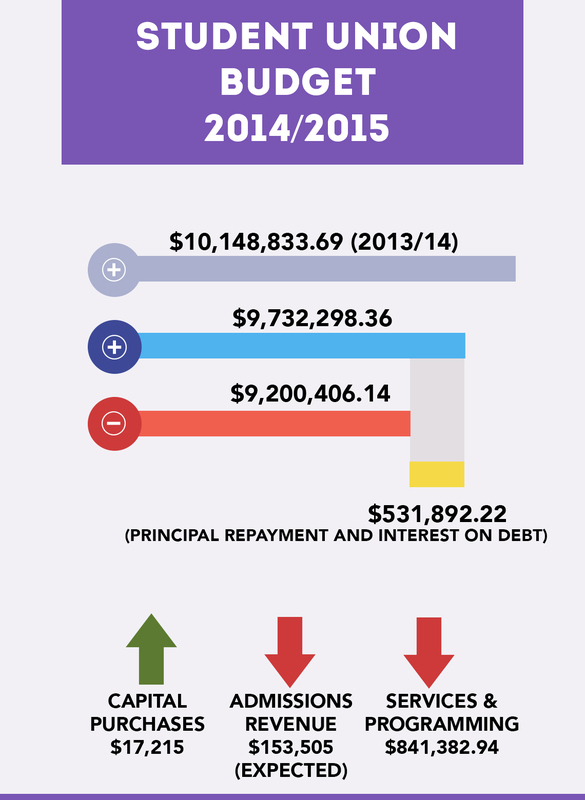 Along with the deficit, the Students’ Union will be paying around $531,892 back for their loans and interest on their debt. This is a $2,000 increase in the deficiency from the year previous. Samantha Deeming, vice-president of finance and administration at the Students’ Union, explained the focus was to be honest with this year’s budget. Deeming and Sam Lambert, president and CEO of the Students’ Union, took a new approach to the budget. In order to become more transparent, Lambert explained that the lines were moved around in order to make the budget more readable and reflect student services. “Transparency was the biggest thing,” Lambert explained. Deeming explained the Union’s debt was a large influence on making the budget. She said the executives took into consideration what the students would need, then used the extra room in expenses to pay off the debt. Major changes in the budget include taking out the staff salaries — including Lambert’s — from the student budget to only reflect the services for students, and a reflection of fewer students coming to Laurier. Many of the projected numbers this year are less than the year previous because revenue will not be the same. “I think the main reason is because we don’t expect demand to be as high with not as many students,” Lambert said. The Union will also be putting $17,215 toward a capital purchase this year, which will be renovations to the Turret. Last year, the Union did not put money toward capital purchases to try to remove some of the debt, but Deeming believes this is a necessary step for the Turret. “This year we’re looking at bringing in an additional revenue stream through the Turret,” she said. The money will go towards putting in new benches and cleaning up the area so it can be rented out for events such as stag and does, receptions and formals. “Housekeeping stuff that needed to happen. It was falling apart,” Lambert said. There was also a $249,551 decrease in services and programming for the upcoming year. Because of the decrease in students, Deeming said the Union will be “very diligent” in the money it gives to its clubs and associations. She used orientation week as an example, explaining that the organization is being strict with purchases that clubs make and working to find sponsorship dollars for events. Deeming said there is “no wiggle room” with the money allotted for o-week.